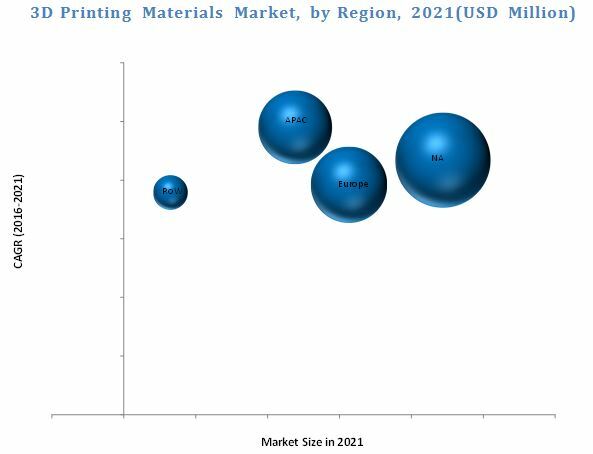 [142 Pages Report] The 3D printing materials market was valued at USD 437.8 million in 2015 and is projected to reach USD 1,409.5 million by 2021, at a CAGR of 21.6% during the forecast period. In this study, 2015 has been considered as the base year, while the forecast period is from 2016 to 2021. 3D printing technology is rapidly gaining momentum in the aerospace & defense industry. The aerospace industry is estimated to be one of the early adapters of this technology. The technology aids designers in developing superior-quality parts without facing restrictions, such as production feasibility, cost, or complexity. 3D printing materials, including metals, are used in manufacturing many aircraft parts, such as wings, jigs, and engine parts. The automotive industry in North America and Europe is estimated to develop a new car using 3D printing technology. This industry is adopting the technology to produce automotive parts in a short time span. The technology has helped the industry in manufacturing complex and lightweight structures cost-effectively. In this report the research methodology used to estimate and forecast the 3D printing materials market begins with capturing data of the key company revenues and raw material costs through secondary research. The product offerings are also taken into consideration to determine the market segmentation. The bottom-up approach was employed to arrive at the overall market size of 3D printing materials from the revenue of the key players in the market. After arriving at the overall market size, the total market was split into several segments and sub segments, which are then verified through primary research by conducting extensive interviews with key people such as CEOs, VPs, directors, and executives. This data triangulation and market breakdown procedures were employed to complete the overall market engineering process and arrive at the exact statistics for all segments and sub segments. The 3D printing materials market comprises manufacturers such as 3D Systems Corporation (U.S.), Arcam AB (Sweden), Arkema S.A. (France), Royal DSM N.V. (Netherlands), Stratasys Ltd. (U.S.), and so on. The application industries of 3D printing materials majorly include aerospace & defense, medical 7 dental, automotive, consumer goods, and among others. In October 2015, 3D Systems Corp. entered into a partnership with the U.S. Army to jointly develop 3D printing materials and technology. The partnership helped the company cater the increasing demand for 3D printing prototype in various applications, such as defense, automotive, medical, among others. In December 2015, Arcam AB expanded its aerospace and medical 3D printing solutions to the U.S. market. The expansion helped the company expand its 3D printing business in the booming U.S. market. The expansion of 3D printing solution invariably increased the demand for 3D printing materials. In November 2015, Royal DSM N.V. introduced a new 3D printing material, Somos Element. The new product development helped the company meet part requirements of end user industries, such as emery, automotive, and aerospace. What are the upcoming trends for 3D printing materials market in developing nations? The 3D printing materials market is estimated at USD 437.8 million in 2015 and is projected to reach USD 1,409.5 million by 2021, at a CAGR of 21.6% from 2016 to 2021. The global 3D printing materials market witnessed a strong growth in the past few years considering the adoption of 3D printing technology, in the U.S., Germany, and developing countries such as the South Korea, Brazil, and China. The growing aerospace & defense, medical & dental, and automotive industries in these countries are driving the 3D printing materials market. The major applications of 3D printing materials are aerospace & defense, medical & dental, automotive, consumer goods, and among others. Other applications include fashion, electronics, art & sculpture, jewelry, food, and architecture. Aerospace & defense is estimated to be the fastest-growing application for 3D printing materials market during the forecast period. Titanium based 3D printing materials offers high strength and stiffness resulting in greater demand in medical and aerospace & defense applications. High cost of 3D printing materials has been a major concern for the market players. Many applications of 3D printing materials are facing restrictions owing to their high cost. Developing low-cost technologies for manufacturing 3D printing materials is a major challenge for researchers and key manufacturers. 3D printing materials are introduced only in high-end and luxury cars owing to their high cost. Having said that, decrease in production cost may promote mass adoption of 3D printing technology in various applications, such as automotive and aerospace & defense, in future. North America is the largest consumer of 3D printing materials. The U.S., Germany, and China are the major markets for 3D printing materials. The North American region is projected to register the highest CAGR during the forecast period. Brazil is expected to drive the 3D printing materials market in the RoW region. The growth of aerospace & defense industry and focus toward harnessing the benefits of 3D printing technology has led to growth of 3D printing materials market. 3D printing materials market by application is segmented into aerospace & defense, medical & dental, automotive, consumer goods, and among others. 3D printing in the aerospace & defense industry is not new, but with the latest technological advancements and invention of new materials in 3D printing have made it a major application. It has been used in the aerospace & defense industry for several years. Metal powders such as titanium, nickel, stainless steel, aluminum, and others are used in aerospace & defense application, as the materials need to withstand extreme conditions. 3D printing with metals is extremely expensive, but the cost is expected to decline in the coming years due to the growing demand from end-use applications. Medical & dental is one of the major applications that use 3D printing technology. Several medical products such as surgical equipment, prosthetics & implants, and tissue engineering products are manufactured through 3D printing technology. Apart from this, 3D printing is also used for technologies in the field of medicine such as orthopedic, dental, and cranio-maxillofacial. The key drivers of the market are new and improved technologies, financial support from governments, and rapid product development at low costs. One of the emerging applications for 3D printing powders in medical & dental segment is printing of medicines and pills. The automotive industry is one of the earliest adapters of 3D printers and will be ready to print a complete car in the near future. Along with manufacturing spare parts in the automotive industry, 3D printers are also used to manufacture and replace damaged parts of the car. With the introduction of 3D printing technology, the future of making cars is set to change. 3D printing helps in continuous factory production for individual automotive parts. Consumer 3D printing, especially home 3D printers is the main reason for the sudden rise in the demand for 3D printing in the recent years. Leading players such as Makerbot, RepRap, and Cubify introduced home 3D printers at low costs wherein anyone could purchase a printer and print their required objects or goods. Generally, plastic materials, especially ABS and PLA are the major consumer choices available at costs that range from USD 150.0 to USD 250.0 per kilo. What are the upcoming hot bets for 3D printing materials market? How market dynamics is with regards to development of new applications of 3D printing materials materials? 3D Systems Corporations (U.S.) and Arcam AB (Sweden) are the few leading players in the 3D printing materials market. 3D Systems Corporation provides 3D printing materials to various industries to grow its business. It creates and maintains its market value by making new products with unique features that enable market differentiation. As a part of its growth strategy for the 3D printing material business, it is mainly focused on new product development and acquisition.